Gaby Stanton, an American professor living in Japan, has lost her job teaching English at Shizuyama University. (No one will tell her exactly why.) Alex Thorn, an American psychologist, is mourning his son, a Shizuyama exchange student who was killed in an accident. (No one will tell him exactly how.) Alex has come to this utterly foreign place to find the truth, and now Gaby is serving as his translator and guide. The key to mastering Japanese, she keeps telling him, is understanding what’s not being said. And in this “deft and delightful” (Karen Joy Fowler) novel, the unsaid truths about everything from work and love to illness and death cast a deafening silence-and tower in the background like Mount Fuji itself. Sara Backer was the first American and first woman to serve as a Visiting Professor at JapanÂ’s national Shizuoka University from 1990 to 1993. She was awarded a Djerassi Resident Artist fellowship in 1999. 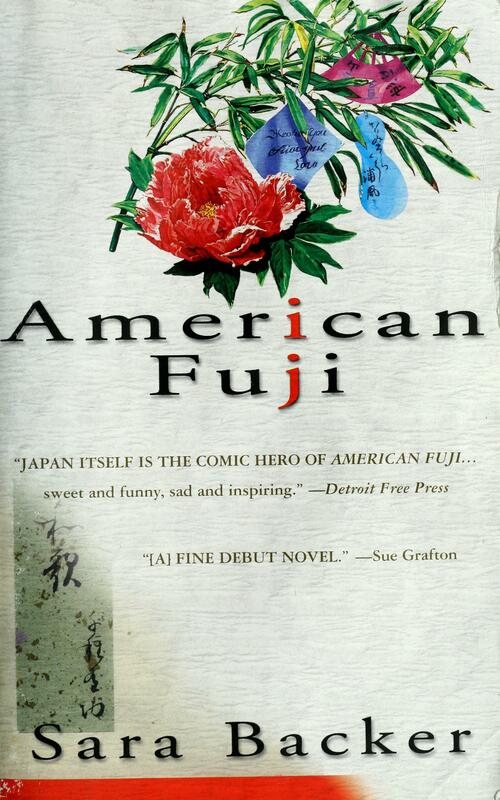 American Fuji is her first novel. A Pushcart Prize nominee, she currently teaches English at the University of Massachusetts. From this novel, what do you gather to be the role of gaijin in modern Japan? “Expect the unexpected” is a phrase that is repeated throughout the novel.What are some examples of this, good and bad? Why do you think this is how life is in Japan? We see many different types of women in this novel—Gaby, Rie, Junko, Mr. Aoshima’s wife. Discuss the role of women in Japan and why Gaby’s life is seen as a pitiable one. We also see many types of men—Alex, Eguchi, Marubatsu, Kaneko, Haneda, Michael, and Lester. Do these characters confirm or contradict your impressions of men in Japan? Why does Gaby begin to feel compassion toward Alex when initially she considers him a burden? Discuss the different ways they are drawn together. For an independent single woman in a foreign country that favors patriarchy and family, Gaby gets along quite well, but is occasionally taken by surprise. Discuss some of the instances where Gaby’s common sense should have alerted her to something amiss. Do you think she chose to ignore red flags on purpose, or have parts of her personality been compromised after living in a foreign land that views single women as inferior? How has Gaby’s illness shaped her personality for better and for worse? The oppressive heat plays an obvious role in the novel. How does it symbolize Alex’s quest? A theme throughout the novel is Japan’s love/hate relationship with Americans. Discuss how Gaby, Alex, and gaijin in general are treated.Why do you think the treatments are so varied? How have things worked for and against Gaby and Alex? “The unsaid” is a nuance in Japan that strikes the Westerners in this novel as difficult to maneuver at times. How does this make Alex’s journey more difficult, especially as a non-native speaker? Discuss how his acceptance of “the unsaid” finally brings him answers. At one point Gaby states:”Oh, I don’t fit in: no foreigner ever does.” Discuss why Gaby has stayed in Japan all these years, even after losing her teaching job.What does she think keeps her there, and what does she discover is really keeping her there? The Japanese are strict on protocol and “follow rules no matter what.” How does this relate to how Cody’s death was handled, and the subsequent cover-up? Do you believe Gaby to be the strongest character among the Westerners (Lester, Michael, and Alex), even though she is regarded as a “sad woman” in Japan? Why or why not? Why does Alex make Gaby feel lonely for the first time since she’s lived in Japan? Explain the parallel between Gaby and Alex both missing pleasure in their lives, and why they let it continue.What finally changes their attitudes? The Italian edition of American Fuji was titled Heart of the Son (Il Cuore del Figlio).Which title do you prefer, and why? Discuss how Alex finally makes his peace with Japan and Cody’s death.